So, (long pause here), you’ve decided to start collecting records. Despite having all this "free" music around you via MP3 , iTunes, Spotify, etc. Well, first of all, congratulations on wanting to hear the real thing. Second, once you lay down the bucks for your first album, you’ll be committed for life to a habit. But aside from these two things, there’s nothing holding you back. However, there are some things to keep in mind that will make your new hobby much more fun and bring you greater amounts of satisfaction. First, look for music that you will like. Perhaps you’re coming from a background where you have been listening to an iPod/iPhone or other ‘digitized’ form. You’ve got Playlists full of great music. What do you like, what do you listen to most often, what do you talk about among your friends and acquaintances? Well, this is where you begin collecting the records you will need/want for your library. Second, you’ll need to decide if you will be limiting yourself to new records exclusively or if you’ll do a mix of new and used (gently used!!!) records. If you decide to go the new release route, it will be a bigger outlay from your wallet since most new records retail from $15.99 on up to a limitation of—roughly—$45.99. Prices are set on popularity of the group or players. Also, genres like classical music can be higher. It all comes down to popularity or limited edition availability. Third, if you decide that going a mixed route, most of your purchases will be through used record stores. This is great as it opens up a wider array of records for you to choose from. One big word here: cultivate the friendship of your store’s owner (most are one-person operations). They will ably assist you in locating good copies of records you are interested in. Be aware though that record store inventory changes daily so you might want to check back often. Fourth, in actually purchasing the records you want, be aware that records are ‘graded’ from NM to G (or even P). Most are in the VG range. NM are almost always brand new and unopened, and one thing for sure: they are either un-played or lightly played. As the grade goes to VG, the record has been played and (we hope) well cared for. Most used records will be in this range. G or P ratings will require a lot more scrutiny as they on first glance may be clean, but they might have other factors affecting them. Also included in this grade is the album cover. Signs of ring wear, tearing, marking of names and the like all affect the grading of the record. 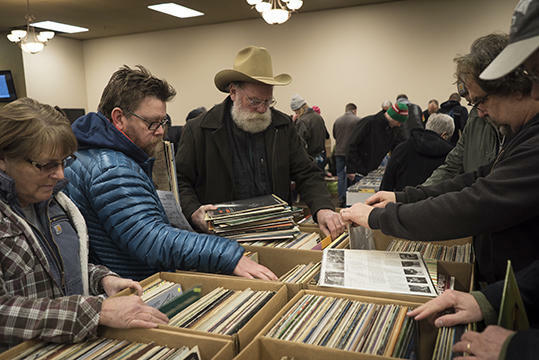 Rely on your dealer to help guide you through the finding of great records (at least until you’re comfortable with noticing the signs of good used records. Fifth, now you have the records you want. But what will you use to play them? An all-in-one portable like a Crosley record player, or will you want a turntable with powered speakers? These are great as the turntable has a pre-amp built in and you can connect to the speakers immediately and start playing music. Or will you require a pre-amp to go between the speakers and the turntable? By the way, a record player is an all in one unit that has everything in a compact package. A turntable is the unit that spins and plays the record but does not have speakers. There is one more type of set up that truly ranks high and will help you hear the full amount of music contained in the grooves of your records. This is the full component system complete with high quality speakers, a receiver and turntable with great cartridge. But it’s the speakers that will make all the difference to you. So, before going this last route, make sure you’ve done a fair amount of research, especially on your speakers or cartridge and make sure you have the room available to the system so you can be comfortable operating it. Once you have your favorite music, your turntable and speakers, you can then look at accessories to keep things clean and tidy. Clean records are happy records and will last longer. This can be anything as simple as a dust-free cloth, or a small device that you use to sweep the record before you play it. If you want, you can get a record washing system so you can clean those really dirty records and bring them back to life like you never thought possible. However, one thing that you most surely will need is a storage unit for as your collection grows, it will need to be stored with the records vertical. It will also be a great place for your turntable to rest. So, now it's up to you to go out and grab some great records and start your music collection!